In the context of the developments described above, IT infrastructures will be more important than ever before. In future, not only individual business processes, but also entire business models and the continued existence of companies, will depend on the stability, availability, adaptability, and security of IT infrastructures. Furthermore, infrastructure services are presently more standardized, which is why the term “commodity IT” has become established. Specialized service providers can offer a quality that many companies do not achieve in their own IT departments. 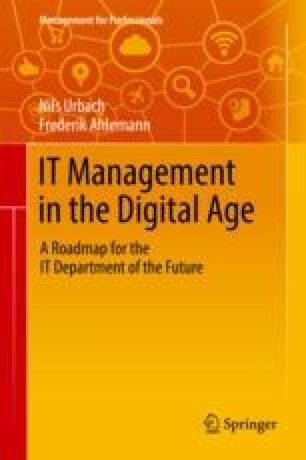 The question why an internal IT department should still operate its own IT infrastructures, arises in this context. In fact, we predict that the future corporate IT will only in isolated cases use their own servers, configure middleware, and install security patches, and we assume that external service providers will completely take over these parts of the IT value chain. That is not all: Virtualization technologies, cloud solutions, as well as the increasing standardization and precise specification of infrastructure service types and performance classes will create entirely new markets. IT infrastructure services are traded on markets and can be purchased as easily as drawing electricity from the wall socket.